Racing at Palm Beach International Raceway. Lost another motor during the race. By the time the heavens opened up and let loose a deluge on Saturday afternoon, we were already back at home. We had arrived at the track on Friday night, hoping to repeat the good fortune we had the previous weekend at Daytona where the car ran virtually flawlessly. But as the title gives away the ending, that was not to be the case. After the Daytona race, there were some items on the car that needed to be addressed. As the motor was just about new, I needed to change its oil. Second, I needed to address the shifting issue in the transmission. Due to the limited time, I decided to change out the conventional oil in the box to Royal Purple Synthetic Syncromax oil. Third, I needed to rotate the tires on the wheels. The outside shoulders were starting to wear, so having the tires dismounted and flopped-over would increase the life of the tires. I had this done at Bello Motorsports in West Palm. Ernie Bello has been racing for over 20 years and his shop can handle working with the racing tires. While getting all this done, I noticed that the pinion seal on the rear differential is leaking. 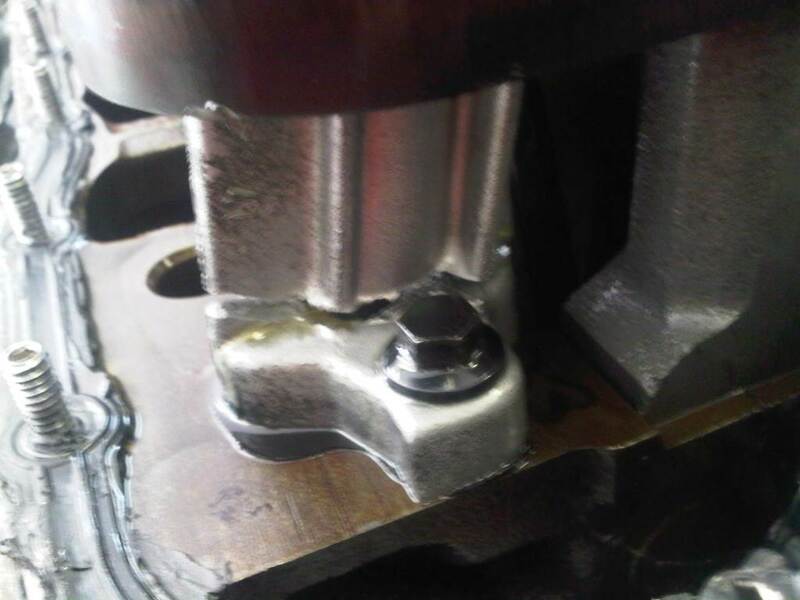 This was due to the bolts backing-out that hold the drive shaft to the pinion flange. 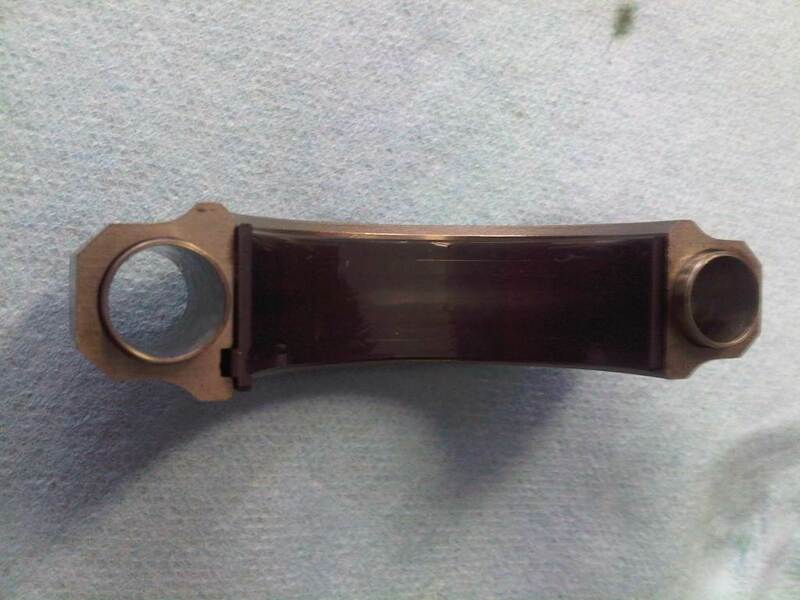 An new pinion seal, blue loctite, and a longer Allen wrench and it was fixed. Now I was ready to load-up the car and go to the track. Trinity and I took the RV to PBIR on Friday afternoon and Tammy me us there after she got off work. We went through registration and set up in the paddock at turns 1 & 2 again, just like last month, then proceeded home in Tammys pickup. The next morning, Tammy and Trinity would be running errands and I would be meeting all my 'guest' at the track. Kyle would be returning as my crew, as would Ken Manchester. My mom was bringing out Carl Large, a friend from church, and I had invited Mark Luhtala, a fellow enthusiast, and he brought along his friend, Jay. We were the first group out on the track for qualifying at 8:00am. The car ran great and I ran a best time of 1:30.5, which put me 4th overall in my group, second in my class (STO). The car ahead of me was a 2006 Corvette, driven by Bud Haverland, with a 1:25.164! That's a quick time! Our race started about 11:30am. The third-place qualifier was a no-show on the grid, so I was moved-up to third at the start. Charles Lee qualified his 1958 STO Corvette behind me, but his over 500HP allowed him to get a jump on me at the start. The race went on between Charles and myself for the first 6 laps. My best lap time of the race was faster than his best time. So no doubt I would have been able to get by him before the end of the 15 lap event. On the end of lap 6, I felt a vibration coming out of turn 10. I checked the gages as I headed down the straight and saw my oil pressure was at zero. I cut-off the motor and coasted to a stop on drivers-right at turns 1 & 2 and waited for a tow at then end of the race. With both pressure gages reading zero, Kyle helped me load up the race car and all the stuff in the RV and we called it a day. I was home and had everything unloaded by 3:00pm. The next day Tammy drove me to the track so I could get our truck. I spent some time talking to Bud and looking at his beautiful 2006 STO Corvette. He says it was dynoed at 435 RWHP, so about 50 to 60 more than me. 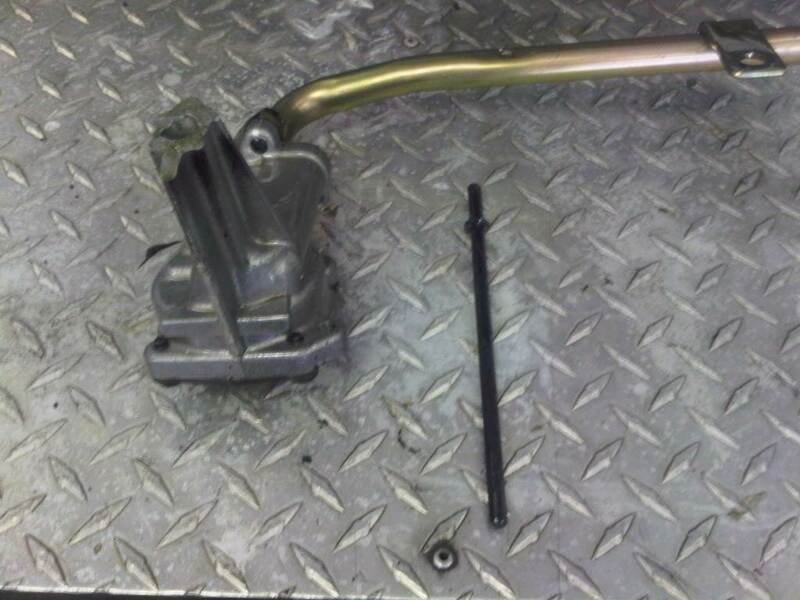 The next day, I pulled the motor and bolted it to the engine stand. 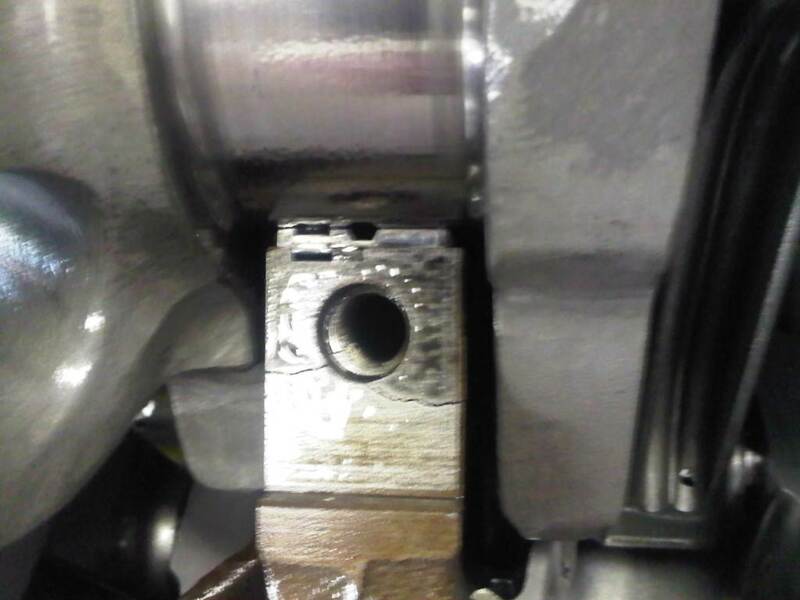 After pulling off the oil pan, I found the oil pump was broken and the drive had become dislodged. 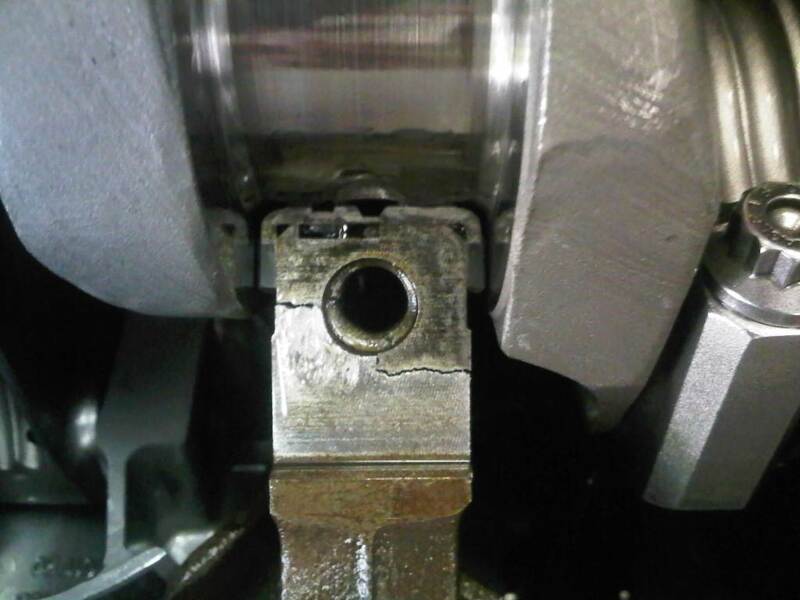 I pulled the cap off the #8 rod and inspected the bearing. It looked great. I called Buddy and gave him the news. Buddy said to pull the #1 rod bearing and a main cap too. Since the motor uses a stud-girdle, I would have to unbolt all the mains anyway. 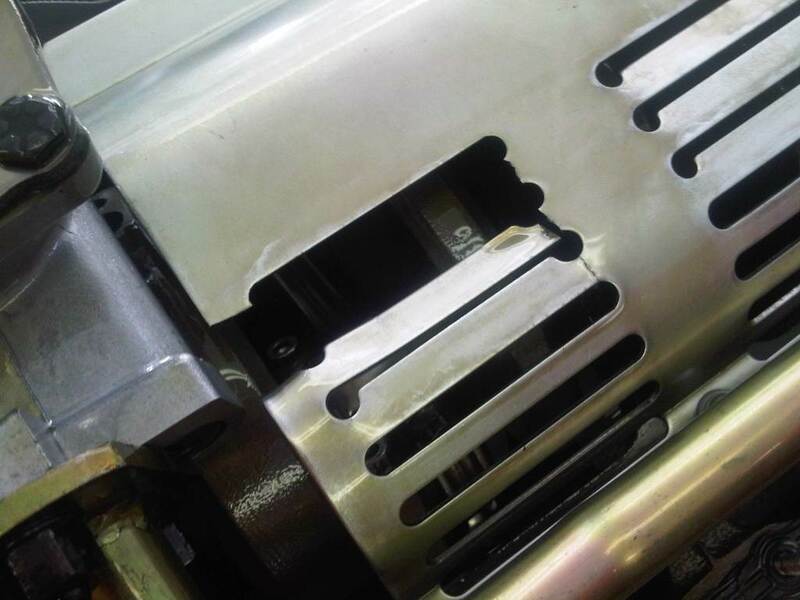 I also wondered why some louvers were knocked-out of my windage tray. When I started to remove the main caps, it became apparent. 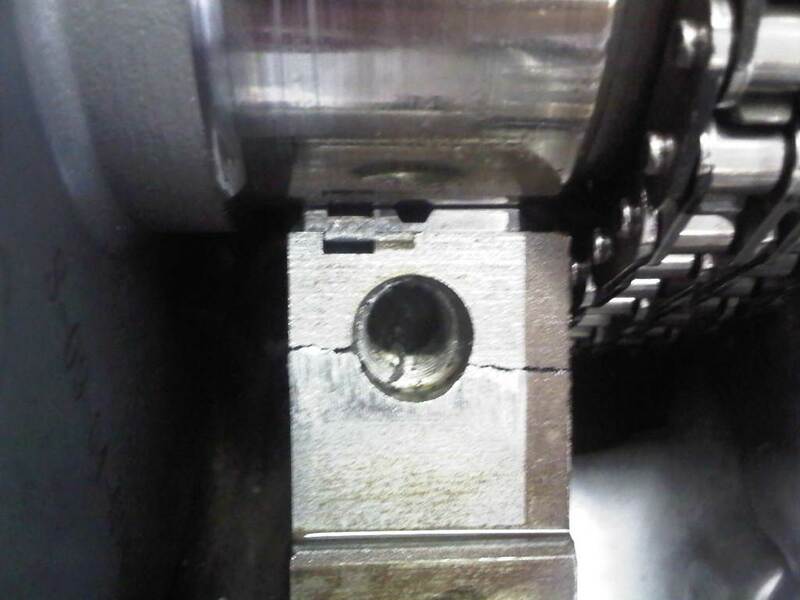 The block had cracked right down the main bolt holes, all the way to the camshaft. 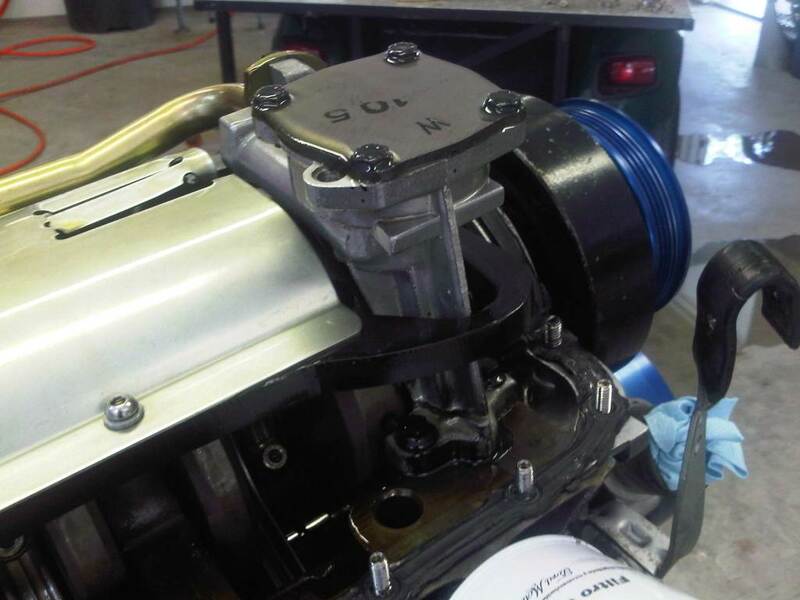 At least the stud-girdle kept all the rotating assembly inside the crankcase this time! I am obviously at the limits of the factory Ford 5.0 blocks, as this is my second failure. I will build my next motor with a 'Boss' block or similar. Watch here for the next motor build!